This case is a pediatric misdiagnosis claim in which nine-month-old infant tragically suffered severe brain injuries. This claim was filed on January 19, 2016. It was the 25th medical malpractice lawsuit filed in Maryland this year. It appears the case was dismissed in 2017 after the defendants were able to strike plaintiffs' expert witnesses. The parents of an otherwise healthy nine-month-old girl notice that she sounds hoarse after they catch her eating the plastic end of a shoestring. They take her to see the Defendant doctor at the after-hours clinic owned and operated by Defendant MedStar Southern Maryland Physicians, LLC. The Defendant doctor examines the infant girl. He diagnoses her with a respiratory infection and a cough, prescribes a liquid Albuterol/Benadryl mixture, and sends her home. Two days later, the infant girl still has hoarseness. Her parents take her to the Children's National Medical Center emergency room. The girl's symptoms worsen. She begins to "desaturate," and experiences respiratory and cardiac arrest, requiring emergent intubation and airway restoration. She is taken to the operating room where a plastic foreign body is found in her trachea, obstructing her airway. As a result of the extended period during which the infant girl's airway was blocked, she suffered severe and permanent brain injuries. Plaintiff's expert says she will not grow up as a normal child. He also opines that the child will not be able to engage in regular social and recreational activities nor will she have the same employment opportunities one day that she otherwise would have. The infant girl's parents bring a lawsuit on her behalf in Prince George's County. They contend that the MedStar doctor should have recognized the likelihood of a foreign object obstructing their daughter's airway. They argue that by not referring their daughter to the emergency room for a consultation with an ear, nose, and throat (ENT) specialist, the doctor violated the standard of care. At the emergency room, a full workup would have been performed on their daughter, the object would have been discovered, and it would have been timely removed without any injury. The parents also bring a claim for the enormous expenses they have incurred and will incur as a result of the Defendants' negligence. This type of case is a plaintiffs' malpractice lawyers dream because of its simplicity. So many malpractice cases take 5 minutes to explain. A jury can understand what this case is about in less than 50 words. Was a cough, hoarseness, and the history of chewing plastic enough to warrant diagnostic testing? That is going to be the single issue if this case goes to trial. The mystery is what happened in those two days that took the child from a hoarse voice to life-altering peril? How often does a latent foreign object cause this type of injury long after the initial exposure? Plaintiff's expert says the doctor should have recognized the likelihood of a foreign body in her throat. That might be reaching beyond what the claim requires. The question is not whether it was likely or not likely that it was a foreign object. The question is given the risk/benefit (and cost) of diagnostic testing, whether a reasonable, prudent doctor would have sent her to the ER when the child did not appear to be in acute distress. What happened in the emergency room at Children's Hospital? The parents drove their child to the hospital which was probably 30 minutes away from their house (assuming they did not move since they filed the lawsuit and assuming they were coming from their home). I'm surprised there is no claim for failing to provide immediate and proper emergency care for this emergency. The defendants may argue - most likely indirectly -- that the hospital's airway obstruction and foreign body aspiration was negligent. Plaintiff's named as experts Diego A. Preciado, M.D. ; Johanna McKenna, R.N. ; Temitayo Oyegbile, M.D. ; Jason Thomas Patregnani, M.D. ; Elizabeth S. Malone, CPNP, G.I. ; Chahira C. Kozma, M.D. ; Karlene Ross, M.D., and James M. Pepple, M.D. The court ruled that these experts could not be called at trial. It seems that the reason they were excluded is that they were named late. One thing at least one of the defendants did in this case was seek an order permitting them to have contact with minor child's doctors. It is a wildly annoying tactic of defense lawyers to seek the opportunity to talk to the child's doctors without a deposition. Thankfully, Judge Krystal Q. Alves shot down the request. If you have been harmed by a medical mistake, we can help you get the justice and compensation you deserve. 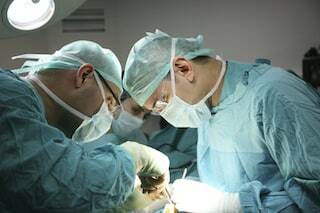 Miller & Zois has a history of results, earning seven-figure verdicts and settlements in surgical malpractice injury and wrongful death cases. Speak to an attorney today at 800-553-8082 or get a free, no-obligation online case review. CALL 800-553-8082 or get a free online medical malpractice injury and wrongful death claims throughout Maryland.